Helping Hand is a Pendleton community outreach ministry. This important ministry is a joint venture between Redeemer, the United Methodist Church, the Presbyterian Church, St. Mary Catholic Church, and the Community Action Program of East Central Oregon [CAPECO]. Helping Hand provides emergency assistance including housing, energy, laundry, food and other miscellaneous needs. On Friday's, Helping Hand volunteers dispense food baskets from the pantry for those who ask for it, while St. Mary Catholic Church fills food requests Monday through Thursday. Please consult Helping Hand's current needs list to see how you can help. Find more information by visiting the Helping Hand website or by calling 541-276-3418. 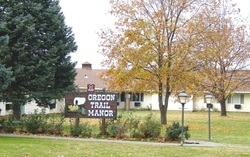 Oregon Trail Manor is a 50-unit apartment complex that provides housing to low income seniors age 62 or older. It was founded in 1969 by five area churches, one of which is Redeemer. The board of directors consists of two members from each church. The facility is located at 2430 SW Perkins Ave in Pendleton and may be contacted at 541-276-6910. Tonya's House provides positive support through an outreach and housing program to runaway, homeless, and at-risk youth. The program supports youth as they work on education goals, attend counseling, and reunite with their families or gain employment. Each spring Redeemer helps Tonya's House with their flower pot and planter sale. This is their yearly fundraiser. Please visit their website for more information. Domestic Violence Services provides shelter for women and children who are victims of domestic violence. We provide paper towels, toilet paper, garbage bags, and new or gently used books for the shelter. Parishioners may leave these items in the collection box by the entrance to Crysler Hall. Details regarding DVS are found on their website. Episcopal Relief and Development (ERD) was founded in 1940 as the Presiding Bishop's Fund for World Relief (PBFWR). The named changed to Episcopal Relief & Development in 2000. Episcopal Relief & Development is the international relief and development agency of the Episcopal Church of the United States, and an independent 501 (c)(3) organization. Episcopal Relief & Development partners with the worldwide Anglican Church, ecumenical agencies, and local organizations to save lives and transform communities. response where the need is greatest. Reed more at the ERD website.